Photographer Russell Tanoue, left, welcomed Augie T, wearing black, to his 12th Birthday Project Fundraiser, a benefit for Aloha United Way and Project Shine, on Friday at Chai's Island Bistro. Several hundred of Tanoue's friends and Honolulu party-scene veterans turned out for the celebration/fundraiser. Most came to the premium-priced VIP "Pre-Party" party that started at 9:30 and included a generous upscale hors d'oeuvres buffet. Augie was hilarious as co-host. Tanoue's "angels" -- Justine Stevens and Hudson Taylor -- greeted everyone at the door. 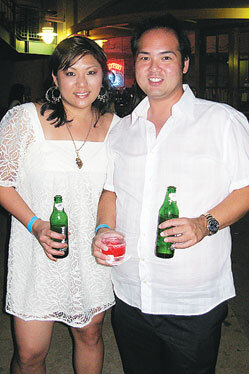 Tanna Dang was representing the Wedding Cafe when she stopped by Tanoue's "White Party" with Lance Ishibashi. Ishibashi says he'll be back on the retail scene soon when his next project, Elle Couture Jewelry, opens later this year. Dave Tucciarone, a multiple Na Hoku Hanohano Award-winning producer and studio engineer, shared a VIP table with "White Party" entertainers Kristian Lei, left, and Anita Hall. Tucciarone, who received his latest Hoku last month for engineering Raiatea Helm's "Hawaiian Blossom" album, expects to be working on studio projects with several local recording artists this fall. Taira Varrow, left, and O-shen chatted outside the restaurant with "White Party" co-host Cindy Paliracio and singer-actor Reno David after the prize drawings and giveaways were over. Paliracio was perfect as Augie T's partner/"straight woman" in co-hosting the event. As for O-shen, the Hoku Award-winning singer-songwriter plans to return to Papua New Guinea later this year to record another album of contemporary Melanesian roots music. Lindsay Furuyu, left, Shari Saiki and Angela Everhart supported the fundraising campaign by selling gift bags and raffle tickets. Saiki guarded the bags and handled the money while Furuyu and Everhart circulated through the crowd promoting sales. It's been a while since Tanoue stopped producing nightclub parties on a regular basis, but there was no question on Friday that he still has the touch and following to throw great events.